The Commons Center is the hub of The Commons. The building includes a main dining hall, private dining rooms for small faculty-student groups, community space for student programs and activities, an academic support center, a campus market and cafe, and offices for the Dean of the Commons Staff. The Leadership in Energy and Environmental Design (LEED) Green Building Rating System, developed by the U.S. Green Building Council (USGBC), has certified that The Commons Center meets a suite of standards for environmentally sustainable construction. group study spaces, exercise space, a mail center, and offices for the Dean of the Commons and staff. Student have 24/7 card access during all other hours. Common Grounds 24-hour coffee shop in The Commons Center offers grab-n-go meals, beverages and sundries. Particular emphasis on using biodegradable/compostable products. The state-of-the-art dining facility at The Commons Center includes a salad bar with sizzle station, Chef’s Table, specialty pizza oven, deli, wok, grill, and vegetarian/vegan food. The exercise room in the Commons Center is located on the 2nd floor and includes both cardiovascular and weight training equipment. 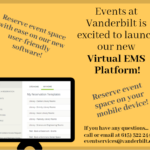 The Commons Center satellite branch handles incoming and outgoing mail, campus mail, metered mail, and packages for Vanderbilt offices. This location also offers: stamp sales, express mail, certified mail, registered mail, insured mail, parcel post, international mail, global priority, after-hours drop boxes, and transferred package pick-up from Station B for residents of The Commons.The package and service window is open from 8:00 am to 4:00pm Monday – Friday (no Saturday service). The second floor suite houses the Dean of The Commons office, and the offices of the staff supporting The Commons Experience. Please visit the Commons website for more information. Located on the second floor, the College of Arts and Science’s Pre-major Academic Advising Resources office (CASPAR) is prepared prepared and eager to provide advice, support, and perspective to all pre-major students in the College of Arts and Science as students make the transition from high school to Vanderbilt and then select a major. The Department of Political Science is located on the 3rd floor of the Commons Center and is home to many research centers and programs, including the center for Study of Democratic Institutions, the Global Feminisms Collaborative, the Latin American Public Opinion Project, and the Research on Individuals, Politics & Society Lab.